Mr John Cranfield of Jamestown was this afternoon officially sworn in as Deputy Speaker of the House of Legislative Council. 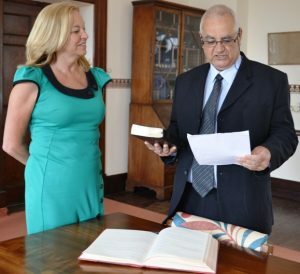 Mr Cranfield took the Oaths of Office for his new role in the presence of HE Governor Lisa Phillips at the Castle. “I would like to extend congratulations to John for being elected as Deputy Speaker of Legislative Council and I look forward to working with him.